Nanny Poppinz has earned the reputation of being a leading Nanny child care provider in Bloomfield Hills and the greater Detroit Michigan area. We follow a consistent process while recruiting and evaluating a Nanny, so that only the very best Detroit child care professionals are referred to your family. Our Nanny services are available to Detroit area around-the-clock. Our experience in child care has taught us that flexible service is the key feature that parents desire. For example, you may have to work late, travel suddenly or may need a Nanny for a child who has suddenly fallen sick. At Nanny Poppinz of Bloomfield Hills and Detroit, we are ready to respond to any childcare situation for you. Our aim is to provide area parents constant support, any time of the day or night. Corporate childcare solutions including onsite childcare and employee emergency childcare. Families who use our childcare services in Bloomfield and the Detroit area are assured of a Nanny who is competent, trustworthy, caring and attentive to the needs of children. As we are a Nanny agency "Created by Moms for Moms", we especially identify with the anxious feelings of a mother for the welfare of their children in their absence. That's why we insist on making the right 'Nanny Match' for your family. Nanny Poppinz reviews each prospective Nanny in the Detroit area, keeping your needs in mind. Before selecting a Nanny for you to interview we evaluate the Nanny thoroughly and see that they match your requirements. We conduct extensive screening (including face-to-face interviews before sending them to you for consideration. If you so desire we help you in making that crucial decision of choosing the most suitable Nanny. 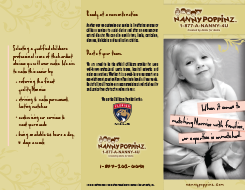 Careful evaluation of individual family requirements and referral of a qualified Nanny to meet every specific family's childcare need and schedule - whether it is for full or part time, live-in or out, permanent or temporary Nanny and even Corporate (Nanny Poppinz provides Nanny child care for the Florida Panthers, Miami Dolphins and Miami Marlins). CPR and first aid training so they can handle emergency situations. Continuing education in becoming the best Nanny that you can be. Call Nanny Poppinz and say goodbye to all the hassles and anxiety associated with looking for a suitable Nanny in the Detroit area area for your child. Call us now at 248-918-0656 for all your childcare needs! Referral fee discounts are available to Military and Law Enforcement families. CPR, First Aid and AED training will be provided by Advantage First Aid. Please visit www.advantagefirstaid.com for a complete list of classes and locations. Then contact Advantage First Aid at (248)366-0776 to schedule and pay for your training. You must identify yourself as a Nanny Poppinz Nanny, using your promotional code, to receive the Nanny Poppinz discount. Once Nanny Poppinz refers you as a permanent part-time or full-time Nanny, we will reimburse your training cost with the submission of your receipt. For a Nanny interview please call Dasly at 954-899-3828.